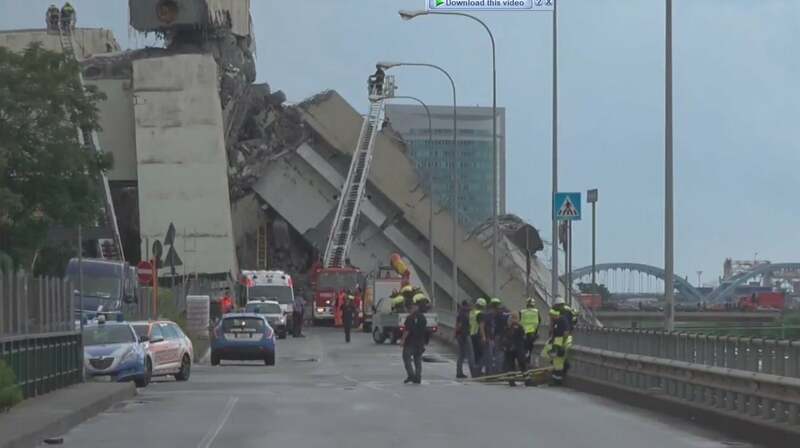 A bridge in Genoa, Italy, known as Ponte Morandi collapsed today, trapping dozens beneath the rubble. There have been 11 confirmed dead in the Genoa bridge collapse, but the death toll is expected to continue to rise. The bridge collapsed around 11:30 am local time. The Genoa bridge collapse didn’t just impact those driving along the bridge, debris and rubble has also destroyed homes beneath the bridge and crushed the railway tracks. Those driving on the section of the bridge that collapsed plummeted 328 feet. Firefighters and paramedics expect to find dozens more killed by the collapse. 200 firefighters along with dozens of police officers and paramedics are working to clear the rubble to find any survivors. So far they have pulled three survivors from the rubble thanks to the help of trained police dogs. One report claims there are at least 10 cars trapped beneath the rubble. “The size of this disaster is epochal, there are dozens of deaths, including people who fell from the bridge and those who remained trapped underneath the rubble. “The firefighters and paramedics are working to pull out from the rubbles the victims, some have already been taken to various hospital in Genoa. “We have received the full support of nearby regions Lombardy and Piedmont, all their hospitals are available to us. Why did the Genoa Bridge Collapse? Authorities have not yet revealed what caused the Genoa bridge collapse. One local media outlet claims the collapse was caused by a structural failure. The collapse could have also been caused by the severe weather in Northern Italy. The region is experiencing dangerously heavy rainfalls, which the national weather service warned could cause landslides and other disasters. Eyewitness accounts claim they saw the central pillar of the bridge collapse before the structure imploded amid the heavy rainfall. Another eyewitness claims to have seen lightning strike the bridge before it collapsed. The Ponte Morandi was originally built in the 1960s before being refurbished in 2016.